Workers at Croatia's largest shipbuilding group Uljanik, who have been on strike for more than a week, began receiving their delayed July salaries on Friday and are set to return to work on Monday. Union leaders and Prime Minister Andrej Plenkovic, whose government struck a deal with a local bank, confirmed the payments for some 4,500 workers at the docks, located in the northern Adriatic cities of Pula and Rijeka. Last Monday the workers protested in Zagreb demanding the government's help. Despite the funds secured for July and August salaries, in line with the government's promise, uncertainty over the survival of Croatia's biggest dock persists. "We have been put in a position to fight for this one salary as the bills are coming and we need money for our children who will start attending a new school year shortly. However, the real problem remains and that is what will happen next with our business and jobs," one of the strikers told reporters. Under European Union rules, the state cannot provide direct financial aid. The two months of salaries have been secured through state guarantees with the bank and Plenkovic said the European Commission had been informed. 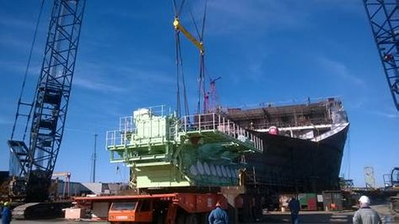 Last January the Commission cleared Croatia's state guarantee for a loan worth 96 million euros ($112 million) to help the shipyard stay afloat. Earlier this year Uljanik chose local firm Kermas Energija as its strategic partner and submitted a restructuring plan which was sent to Brussels for approval and is still pending. The workers now want new management to be appointed to restructure the business. Croatia's once prosperous shipbuilding industry has been struggling to survive since the country's independence from Yugoslavia in the early 1990s. It has gradually lost business to Asian shipbuilders, such as South Korea, missing opportunities to modernise and produce more sophisticated vessels. Loss-making Uljanik's problems are also a potential threat to state coffers as the government has extended guarantees worth several hundred million euros for loans to the shipbuilder. Many analysts say that Uljanik, and also two other Croatian docks whose restructuring was a key condition of Zagreb's EU entry in 2013, face a struggle for survival which may involve job losses and a search for new metal production niches.